The Unfinished Puzzle ebook will be free March 13, 2018 on Amazon.com. The Unfinished Puzzle is a deep, eye-opening devotional that launches Tuesday, March 13th and Wednesday, the 14th. The ebook will be free during this time on Amazon.com: http://a.co/3rFPwYi. The Unfinished Puzzle is a 50-day devotional which will take you on a personal journey and strengthen your friendship with your Creator. This unique book shows authentic life stories tied in with scripture to show how God is a true friend rather than the sometimes portrayed enforcer we see Him as. As life is compared to a puzzle which we often get frustrated with, we are able to see how God perhaps does his best work in the midst of our storms through raw, real-life analogies throughout the devotional. 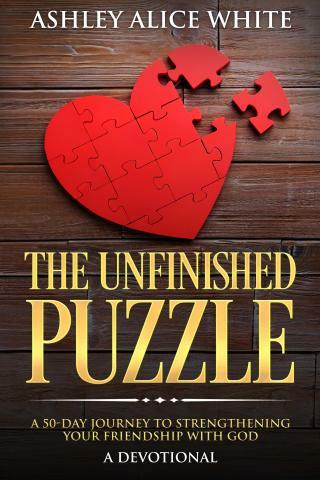 Visit http://www.ashleyawhiteauthor.com to download the free printable Unfinished Puzzle Checklist that goes along with this book or can be used on its own, plus a free short story. Author Ashley Alice White of Maine is only 22, but she is full of wisdom and sees life differently. Her travels to places like Haiti and England shine through in her stories, and she dreams of traveling to many more places. “My father was and is a pastor, which means I grew up in churches and learned about Jesus at a very young age. I’ve always believed in Jesus and knew Him, but I never knew Him as a friend, a father and a protector, until I went on my own journey,” Ashley says. Ashley relates with her readers, and as you read this book, you will feel as though you are reading a letter from your best friend. Ashley has had her share of struggles, especially when she was diagnosed with auto immune disease. “Each time I worked on this book, I had different emotions and situations going on in my life that were not easy, but sometimes they were really happy. I’ve been extremely sick where I couldn’t see a glimpse of light and the only thing I could do was trust in God, completely, for the unimaginable to happen. I’ve been heartbroken and depressed as well as anxious and nervous,” says the author. Get a free copy of The Unfinished Puzzle March 13th and 14th. The ebook will be free during this time on Amazon.com: http://a.co/3rFPwYi.